Watching a colony of Mexican free-tailed bats emerge is truly a special experience! During emergence, the bats spiral upwards in a counter-clockwise direction in order to gain altitude. Aerial predators, such as red-tailed hawks, are sometimes seen catching bats as they emerge, and terrestrial predators, such as raccoons, feed on fallen bats. The large, serpentine column of bats can travel as high as 10,000 feet and 60 miles, one-way, each night to feed on agricultural pests such as the corn earworm (a.k.a. cotton bollworm), cutworm, and webworm moths. Each bat can eat its weight in insects nightly, and the Old Tunnel colony may devour over 25 tons of moths per night! When visiting Old Tunnel, we recommend bringing a pair of binoculars to get the best view of the bat emergence. Call (866) 978-2287 to get the latest emergence time information. Visitors can enjoy the bat emergence from May through October by choosing three options: viewing the emergence from the upper viewing area, participating in a lower viewing area tour, or making special group tour reservations for your adult or youth group. The upper viewing area, located adjacent to the parking area, is open nightly for use by the general public. The scenic view from the upper viewing area allows visitors to experience the rugged beauty of the Texas Hill Country. Many bicyclists, motorcyclists, and car clubs stop at Old Tunnel to enjoy this view. Bats are best viewed from this area during August and September, when bat emergence times are earlier and more light is present. Fantastic views of red-tailed hawks feeding on emerging bats can also be seen from this area. No fees are charged and no passports or permits are required. To protect and conserve the resources and for the safety of our visitors, we only allow 250 people at the upper viewing area. If we reach that limit we close off the parking lot next to the upper viewing area and will admit more visitors to the upper viewing area as people leave. Consider bringing chairs and/or a blanket to sit on in the overflow area, in case you have a long wait. A close-up view of the emergence is one of the most unique experiences in nature. The flapping of millions of tiny wings is usually audible and often creates a light wind that can be felt by visitors in the lower viewing area. Lower viewing area tours are conducted Thursday through Sunday, May through October. To protect and conserve the resources and for the safety of our visitors, we only allow 70 people at the lower viewing area. 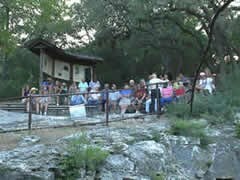 An educational program is given about bats, with an emphasis on the fascinating life history of the Mexican free-tailed bat (Tadarida brasiliensis mexicana). Seats are filled on a first-come, first-served basis with a maximum seating capacity of 70 visitors. Reservations are not accepted. The activity tour fee for the lower viewing area is $5 per person ages 4 and up. Due to the bat’s sensitivity to noise disturbance, children age 3 and under are not allowed at the lower viewing area. We do not accept the Texas State Parks Pass or the Bluebonnet Pass. These passes cover the entrance fee to state parks, but not activity and tour fees. We also do not accept Limited Public Use and Annual Public Hunting Permits. We only accept cash or check. This park does not have cash on hand and is not able to make change; please bring the exact amount of cash for payment. Tours begin approximately one hour prior to bat emergence time. Composting toilets are present at the upper viewing area, but are only open during the evening hours from May through October and during special events. Conducted at the lower viewing area Monday through Wednesday evenings from May through October for organized groups of up to 70 people. These tours are offered on the basis of no more than two per week and no more than four per month. Reservations are required. Passports or permits, including the Texas State Parks Pass, are not accepted. Special group tour fee is $5 per person, 35-person minimum and 70-person maximum. To schedule a special group tour, please e-mail the park.